Welcome to Psycho Drive-In’s 31 Days of Schlocktober celebration! 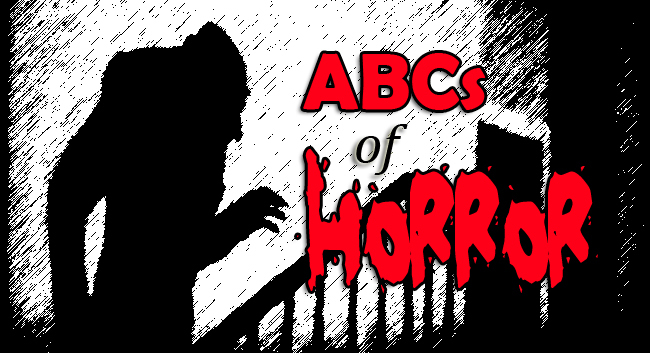 This year we’ve decided to present the ABCs of Horror, with entries every day this month providing Director information, Best-of lists, Genre overviews, and Reviews of films and franchises, all in alphabetical order! Today brings us S is for Sentinel! Michael Winner‘s The Sentinel pays off but it takes a loooong time. The effects are adequate for 1976 but nothing too spectacular. There is one disturbing scene, one terrifying scene, lots of talking in between and a tremendous ending that makes the journey worth it. One more thing this movie is good for; early career celebrity watching. Tons of famous faces are in this film. The setting is 1970’s Brooklyn. A young model, Alison Parker (Cristina Raines), is trying to assert her independence by renting her own apartment instead of shacking up with her lawyer boyfriend, Michael Lerman (Chris Sarandon). Real estate agent, Miss Logan (Ava Gardner) introduces Alison to a “too good to be true” furnished apartment. After she moves in, strange things begin happening. Alison begins hearing strange noises coming from the apartments upstairs and the other residents are eccentric, to say the least. Alison begins to suffer fainting spells and confusion much to her commercial director (Jerry Orbach) and photographer’s (Jeff Goldblum) dismay. From there, things just get worse. The other residents of Alison’s apartment building introduce themselves and each is stranger than the last. 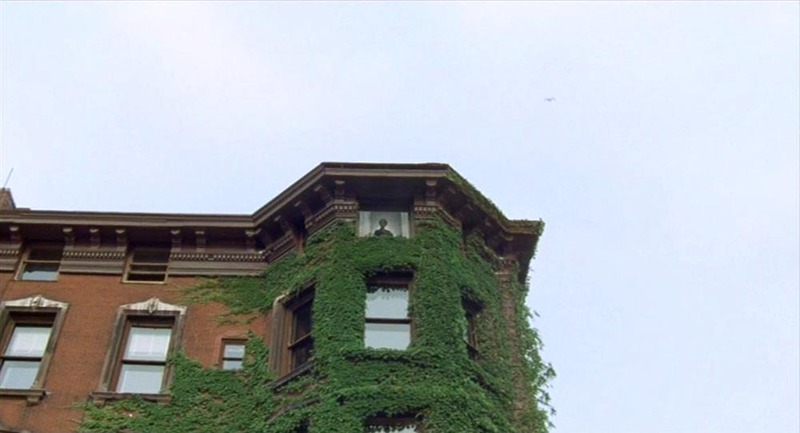 There is Father Halliran (John Carradine), a blind priest who never leaves his seat in front of an upstairs window. 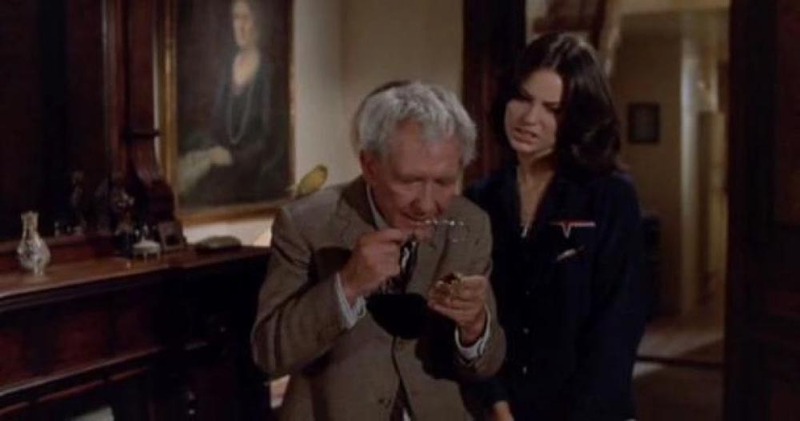 Charles Chazen (Burgess Meredith), an effete, older gentlemen who befriends Alison and has very public relationship with his pets. Then there is the odd relationship between Gerde Engstrom (Sylvia Miles) and her lover (I guess) Sandra (Beverly D’Angelo). Within minutes of meeting Alison, Sandra masturbates in front of her while Gerde is out of the room, making Alison, and everyone else watching this film, uncomfortable. The whole bizarre cast is joined in a surprise party for Chazen’s cat. As Alison recounts the party to Miss Logan, the real estate agent reveals that Alison and Father Halliran are the ONLY residents. The rest of the building has been vacant for years. Other than the climax of the film, The Sentinel has only one other truly frightening moment. Alison hears some strange noises and, in proper horror movie fashion, goes to investigate in her pajamas with a knife and a flashlight. After her flashlight gives up the ghost (get it?) she is confronted by the ghoulish corpse of her recently departed father (Fred Stuthman). She hacks at his face with her knife and the results are grisly. Yes, the effects are disturbing but the entire sequence leading up to it is sphincter-shrinkingly scary. A mysterious death occurs near the building and the victim’s wounds bear a striking resemblance to the hacking and slashing Alison gave her dead father. The victim knew Michael Lerner and that leads two detectives (Eli Wallach and Christopher Walken) to suspect him of foul play. It seems Michael was accused of staging his late wife’s suicide. Alison has a history of suicide attempts as well. She slit her wrists after catching her Father cheating on her mother. All of that is a bit of a mess. Alison’s suicide attempt becomes central to the story but the minor plot point with Michael and his wife does little more than establish him as a somewhat shady person. It felt a little pointless since it occurred so late in the film. If you would rather not know what happens at the end then I’ll leave you with this: the third act makes the first two worth every minute. The apartment building is actually a gate to Hell. The residents are all damned souls and demons who want nothing more than freedom. The only thing standing in their way is Father Halliran. The blind priest also attempted suicide once and for that act, his soul was damned. A sect of excommunicated priests (José Ferrer and Arthur Kennedy) offered him a chance at heaven by allowing him to guard the gate. A sentinel against the darkness. Throughout the centuries, failed suicides have stood watch over this infernal portal. Halliran is dying and Alison is meant to be his replacement. The residents reappear in haunting forms, led by an evil and energized Charles Chazen. To illustrate the terror of looming darkness, The Sentinel avoided flashy special effects and traditional ghostly images and, instead, employed dozens of genuinely malformed actors to stumble after Alison as she races toward Father Halliran’s upstairs apartment. A chase like this hadn’t been seen in the movies since Tod Browning’s Freaks. In these enlightened times, we can kid ourselves into believing people who suffer through such affliction are “just like us” and, indeed they are, but the horrific truth is that “normal” people are repulsed by such imagery. To see a real person with a 30 pound facial tumor brings the horror home. That could be us up there. It IS us up there. Hell is real. Like a Shredded Mini-Wheat; one side of me is insulted while the other is amazed by the ending of The Sentinel. Whether brilliant or merely offensive, the last 20 minutes of The Sentinel left a scar on my brain and that is just damn fine cinema. Celebrity Watch Update: Tom Berenger and Nana Visitor are the new, young couple who move into a newly vacant gateway to Hell and Richard Dreyfuss can be seen, briefly, talking to a random woman on the street. This movie’s got everybody in it!